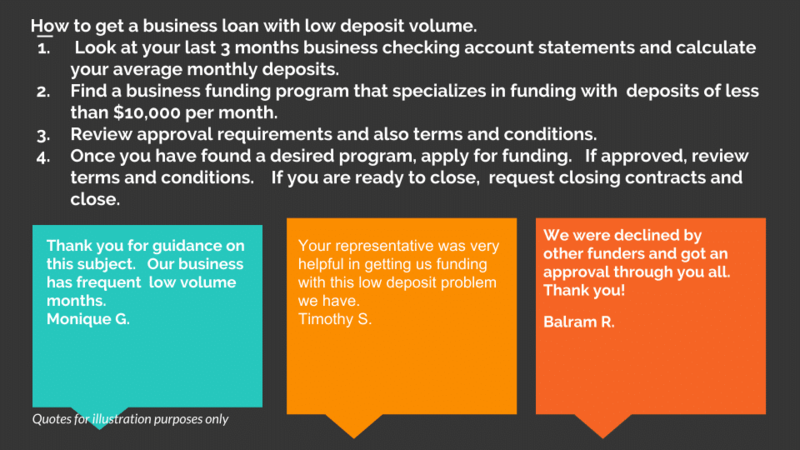 If your business was turned down for a business loan for having low deposit volume, programs are now available to get approved for business funding. You can get approved with deposits of less than $10,000 per month. Your business can even get funding with deposits as low as $7,500 per month and as low as $5,000 per month. Step 1 Look at your last 3 months business checking account statements and document your total deposits. 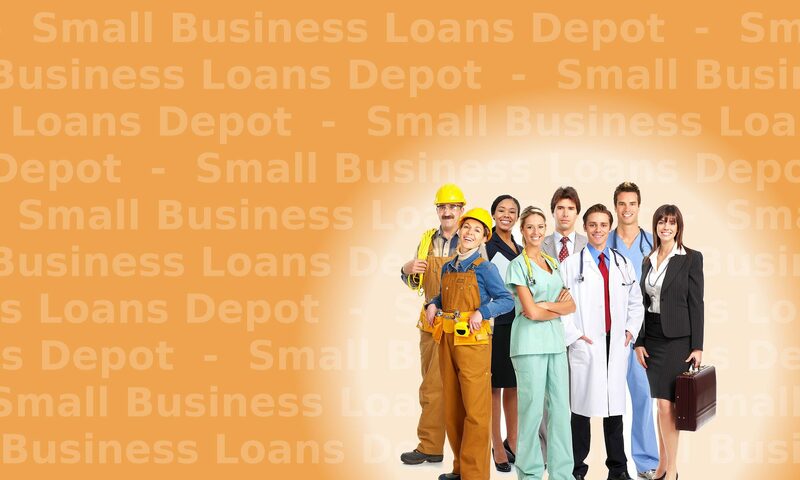 Step 2 Search for a business loan program that specializes in funding with average deposits of less than $10,000 per month. Step 4 If satisfied, apply for funding. 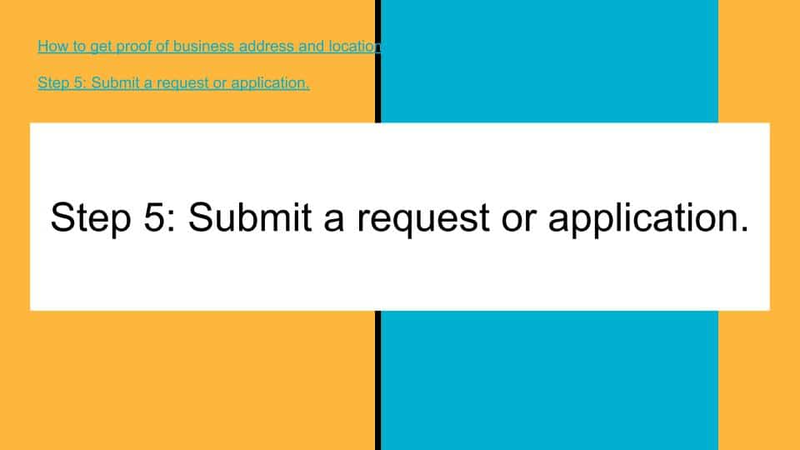 When you are approved, review approval terms. If you want to close the transaction, request and complete closing documents. span style=”font-size: x-large;”>Secure DocuSign 30 Second Low Deposit Volume Application here. Does your business have low monthly deposit volume? Find a program that your business will be approved for. My business deposit volume is less than $10,000 per month. Can I get business funding with deposit volume that low? Yes. Your business can get funding with monthly revenues as low as $7,500. In some cases, low business revenue can be as low as $5,000 per month and your business can still get funding. Why do lenders require $10,000 per month in deposits? Many funders believe that after a business deducts basic expenses such as lease rental payments, utilities, insurance and inventory, they will not have enough revenue to repay any loans or advances of any kind. Many funders believe a business has to have at least $10,000 to $15,000 or more per month in gross revenues to be able to handle any kind of funding. Lenders believe if revenues are less than that, a business will get behind on payments and go into default. How much can I get if my deposits are minimal or reduced amounts? It depends on how low the deposits are, your personal credit score, average daily balances, time in business and some other approval requirements. In most cases, if your average monthly deposits are between $5,000 and $10,000 per month, an approval offer will in the $2,500 to $5,000 range. It is not as likely to get approvals in the $10,000 or higher range. My business needs more than what we were approved for. The approval amount was too low and we need more. Can we get more funding for our business? Your business may be able to get more funding. If your business needs more funding than the approval amount, you can either get a 2nd position funding or another type of funding. Bank statement loans often allow for a supplemental funding. Consider other funding programs. Your business may be a good fit for other options that are based on Accounts Receivables or Real Estate and others. Our deposit volume is under $5,000 per month and we had some overdrafts. Can we still get funding? There are other programs your business may qualify for. If your credit score is high enough, or your business has accounts receivables or other assets, you may be able to qualify for these other programs. Contact us to discuss and review.